How to get from Hanoi to Sapa EASILY: Train or Bus to Sapa? Due to its location, around 350km from Hanoi, Sapa happens to also be a region in Vietnam that a lot of tourists bypass as it requires slightly more effort to reach; however if you read our post about trekking in Sapa here, you will realize why you simply have to make the effort to go! The only choice you have to make is whether to take the train or bus to Sapa. In this post on how to get from Hanoi to Sapa (or vice versa), we will outline which transport mode is best and most efficient. There are various means of getting from Hanoi to Sapa. The most popular way to travel from Hanoi to Sapa is to either choose between an overnight sleeper train or an express bus (there is no airport in Sapa, so cross that Hanoi to Sapa Flight idea off your list!). I’ll be comparing both as we travelled from Hanoi to Sapa by train, but decided to go with the bus option to get from Sapa to Hanoi! Which to choose? Bus or train to Sapa? Let us help you choose! 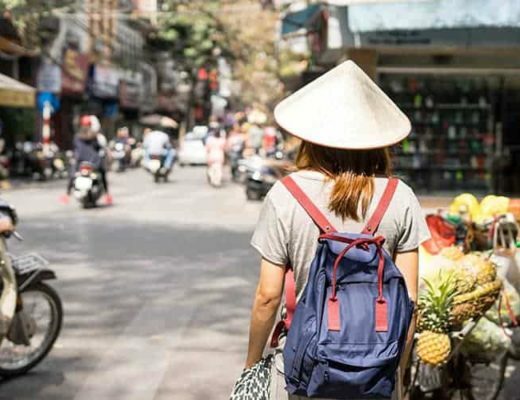 Note: We have other transport guides as well, check out our guide on how to get from Danang to Hoi An here, or how to get from Hanoi to Hoi An here. 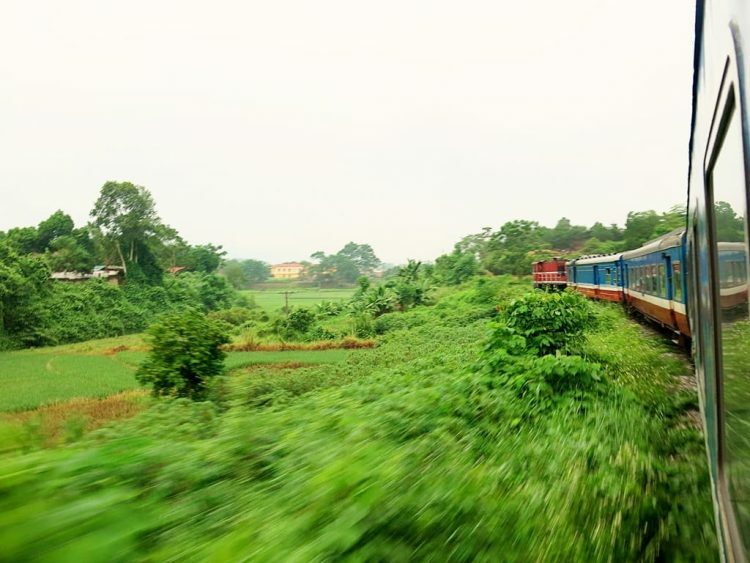 Book your Sapa to Hanoi Train Tickets Online Today! 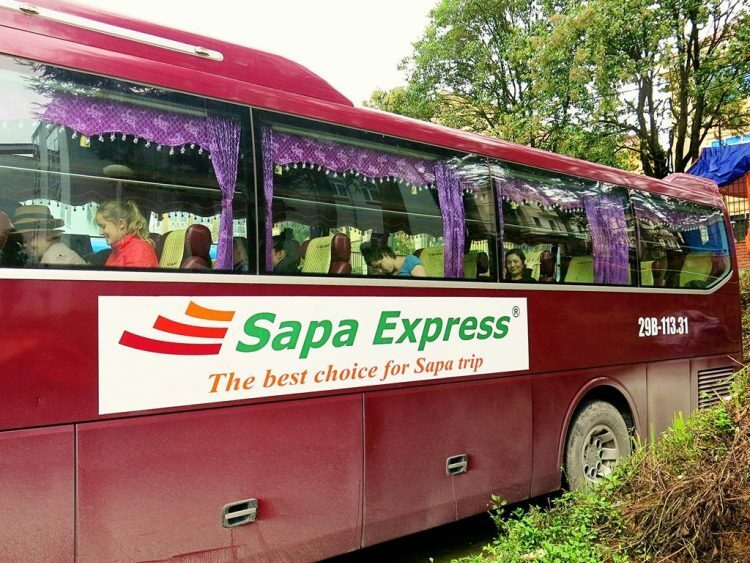 Book your Luxury Eco Sapa Bus Tickets Online Today! Finding it to Tricky to Choose? Why not Simply Book one of these Sapa Tours from Hanoi! Sapa is located around 350km from Hanoi! Disclaimer: Wanderluststorytellers.com uses affiliate links in this post. Lao Cai - around 38km from Sa Pa, you will need to get a taxi or transfer to get there. SaPa - walking distance from most hotels. Read more about what to do in Sapa! Experience the ‘Bora Bora' Resort of Sapa! Travel from Hanoi to Sapa by Overnight Train! Easy and trustworthy way to book your train or bus tickets is simply by hopping over to this site here! It is a great way to save ‘time’ as you travel overnight. If you choose to go with the train from Hanoi to Sapa option, it is important to choose the ‘soft-sleeper’ option. You either have the option on this train of sharing your cabin with other people (4 pax) or alternatively to purchase all 4 tickets for you and your partner/friend which means you now have what they call a VIP private cabin. We thought the cabins were beautifully decorated, soft pillows and mattresses, slippers under the bed. There were also free water, snacks, toothbrushes in each cabin. We were grateful for the electrical points as well so that we could charge up our electronics before hitting Bac Ha markets upon arrival in the Sapa region. The train also has some western style toilets for those of you who would be concerned about that! They stayed fairly clean for our train trip and had toilet paper for the whole duration of the night – although I still suggest you take some of your own just for in case! You won’t get to see much scenery as it will be pitch black outside for the majority of your trip. Due to the age of the train and the railroad tracks, the ride will be anything but smooth. We struggled to sleep (despite taking sleeping pills) as the train rocked us back and forth! At various stages of the night, I could feel my heart in my throat as I thought that the train was about to derail! As we had a private berth, the top two beds were positioned up and against the wall out of the way. However, this left the chains that normally kept them in place loose. They were loudly clanging about all night long! I’m not sure if this is an issue if you share your cabin and all beds are occupied?? Even though I had earplugs in, I still struggled to sleep with the noise! We did try wrapping our clothes around the chains to prevent them from clanging, but tricks of the trade seemed to let us down! The train drops you off in Lao Cai. Lao Cai happens to be about 38 km from Sapa. Which doesn’t sound like much, but considering the roads bend and weave through mountains, the drive to get to Sapa can take around 45 min! As we made our way straight to the Bac Ha Markets, we did not mind that the final train destination was in Lao Cai instead of Sapa. Tickets for the train to Sapa are around $32 – $41 US per person. If you want a private room, you will need to purchase 4 tickets as the rooms are meant to fit 4 sleeping bodies! So a private room will cost you around $140 – $165 US. The journey from Hanoi to Sapa will take around 8 hours. There are various other companies that operate trains from Hanoi to Sapa (or vice versa) to choose from as well! We were meant to be on the Fransipan Express Train (which is another great option in comparison to the Sapaly) but missed the train due to a festival causing traffic chaos in Hanoi. 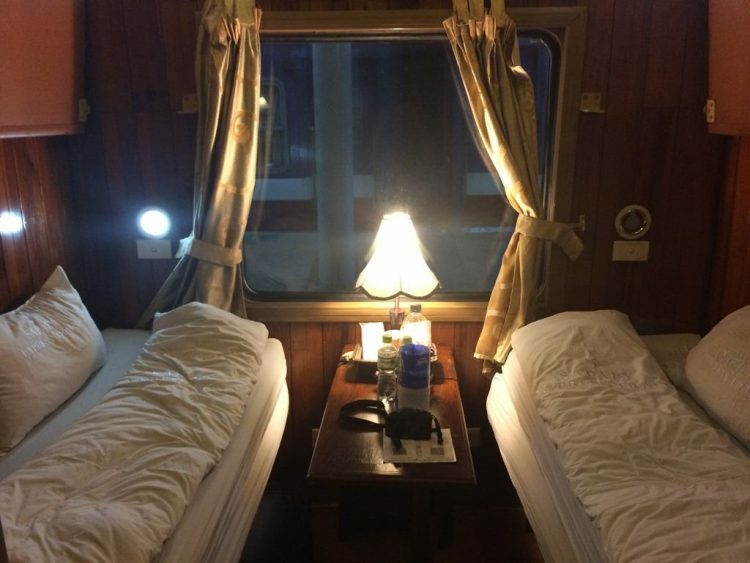 If you decide to choose a different Sapa Hanoi train option, please do your research as you will soon find the trains are most definitely NOT equal in value or quality! We only recommend the Fransipan Train and the Sapaly Train! It can be tricky to organize tickets when in Vietnam, so why not grab the tickets right now! 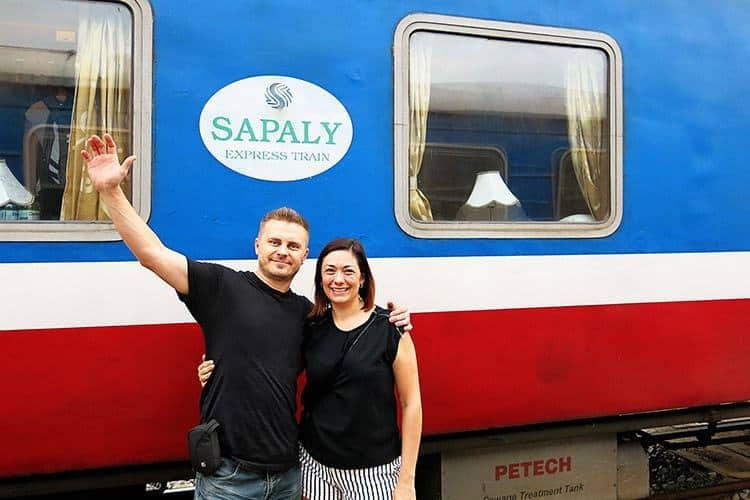 We only recommend overnight train travel on either Sapaly or Fransipan Express. If it is high season, you might most likely struggle to get a private sleeping room if you leave it too late! You can either book your train ticket from Hanoi to Sapa online here or to make life easier for you, we have simply included their search box below! Discover the Real Gems of Hanoi! Our Choice of a ‘Cheap' Hotel in Hanoi Old Quarter! Because of the fact that we wanted to get a decent night sleep before heading to Halong Bay, we chose to try out the bus on the way back from Sapa to Hanoi. This meant that we could book a hotel in Hanoi for the night before heading off in the early morning towards our cruise on Halong Bay. 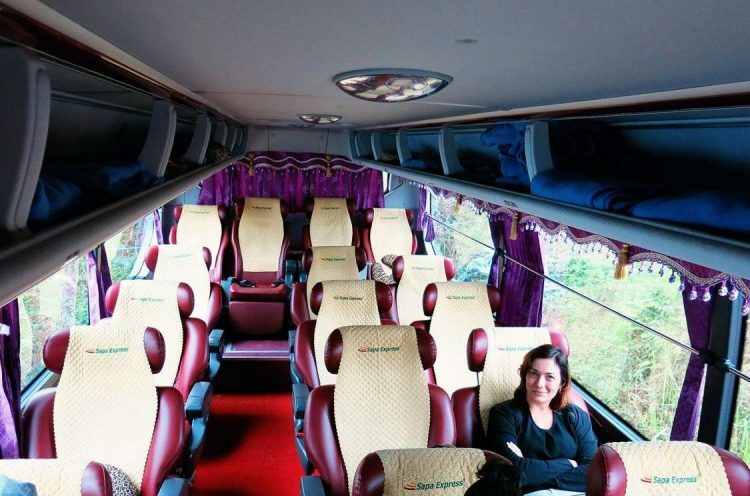 The Express bus to Sapa (or vice versa) is a very comfortable bus to travel in. The seats could slightly recline, we had our laptop with us, so watched some Anthony Bourdaine to kill the time! The bus travels in the day, which means you that you can see some pretty spectacular scenery on the drive! It also means that you can get some good sleep in a hotel once you arrive at your destination. They gave us a bottle of water and a small packet of snacks as we were climbing onto the bus. Blankets and neck pillows were available, on the Hanoi to Sapa by bus, for use as well. The Hanoi Sapa bus makes a stop halfway through the trip at a servo-type stop point. It is great to stretch the legs for 30 min and grab something cool to drink, and if you are brave, you might want to grab some food there as well! A word of warning, there are two sets of toilets here. One of which the locals use ….. gutter on the floor, bucket-water flush system, no toilet paper. I used these toilets, they did not smell polite at all!! It was a struggle! However as we walked around the grounds, we realized that there are touristy-style toilets at the opposite end to where our bus stopped!! DOH!!!!!!! I didn’t go in to investigate as they were charging the tourists a small fee on entry, but I would suggest you have some cash on hand to pay for the better toilets. There is only one toilet break, so bladder control is important haha. Since writing this post, we have found a new bus company that looks brilliant!! I think Eco Sapa is definitely the new best bus from Hanoi to Sapa. If you book a bus ticket, we recommend you book with this luxurious bus company as their buses look heavenly! Tickets are around US $20-$25 per person. There are buses that run at various times of the day! The journey on the bus from Sapa to Hanoi (or vice versa) will take around 5 1/2 hours. The journey includes a 30 min stop to allow for a toilet break. It will also be a good opportunity to grab something to eat. It can be tricky to organize tickets when in Vietnam, so why not grab the tickets right now! 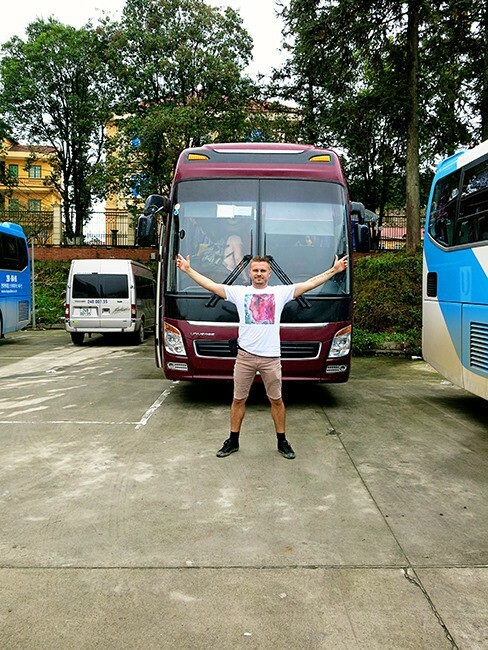 There are only a few buses that run from Hanoi to Sapa, so best to secure your spot now, otherwise, if it is high season, you will most likely miss out! The Eco Sapa buses are a bit of a step up from our trip with Sapa Express! This company is all about comfort and luxury! You can either book your Sapa Hanoi bus tickets online here or to make life easier for you, we have simply included their search box below! Popular Accommodation Options in Sapa! 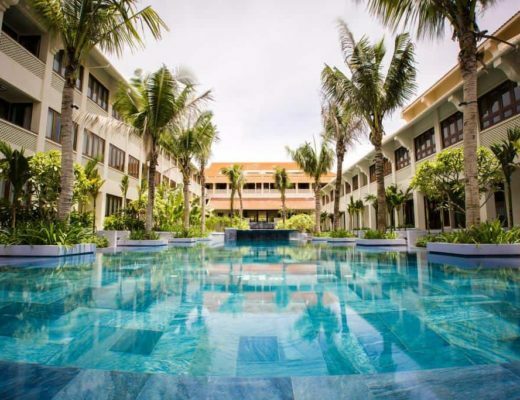 U Sapa Hotel – Compare Prices | Read Reviews | Book it Now! Sapa Panorama Hotel – Compare Prices | Read Reviews | Book it Now! Sunny Mountain Hotel – Compare Prices | Read Reviews | Book it Now! Another great alternative is to simply organize your own private transfer from your hotel in Hanoi to your hotel in Sapa! This option will ensure that your transfer is stress-free and super easy! But will obviously come at a slightly higher cost! If you wish to organize a private transfer, we can recommend Blacklane Transfers. Your transfer from your Hanoi hotel to your Sapa hotel will cost you around US $350. Does this sound all a bit too tricky? Well, good news as you can simply join one of the Sapa Tours from Hanoi! We highly recommend this 2 night, 1 day Sapa hiking tour! I hope that the information here will help you to figure out your travels plans from Hanoi to Sapa. I personally think that the best way to get from Hanoi to Sapa is by bus, and would take that option if we ever go back to Sapa. However, the train definitely remains a fun memory in mind! It is important to weigh up the pro’s and con’s of each style of travel to pick the one that makes you feel most comfortable! Whichever you choose we truly feel that the trip is worth the destination! Sapa was one of my favorite regions of Vietnam! So over to you? Which of the options appeal to you the most?Have you ever travelled from Hanoi to Sapa? How did you go about it? To read more about where we stayed in Sapa, click here. To read about our other stories of our travels through Vietnam, click here. Hey. Thanks for this post! I’ll be going up to Hanoi in June and I could barely find any recent reviews on the bus option. Majority of the reviews on the bus recommend against it. So, I’m just wondering how safe would you say the road is? Yes, people think you will die if you take the bus haha!! I felt more unsafe on the train. We had a few moments of sharp breaking on the highway with the bus, and I’m sure he did speed, but to be honest, you will need to take a taxi or transfer from the train to get to sapa anyways and that drive will be a bit scary too as it around bends and turns with high cliffs – I would take the bus option next time as I love Sapa! Any sort of driving in Vietnam can be a bit scary though 🙂 Hope your trip goes well!!! Love Hanoi! Most visitors to Vietnam are overwhelmed by the sublime beauty of the country’s natural setting: the Red River Delta in the north, the Mekong Delta in the south and almost the entire coastal strip are a patchwork of brilliant green rice paddies tended by women in conical hats. There are some beautiful beaches along the coast, while inland there are soaring mountains, some of which are cloaked by dense, misty forests. Vietnam also offers an opportunity to see a country of traditional charm and rare beauty rapidly opening up to the outside world. Yes Vietnam is very diverse and each region and area is unique! We love Vietnam too 😉 Thanks for sharing your passion with us! Vietnam uses the Dong as its currency. Today, the exchange rate is roughly 20,000 Dong to 1 USD. Needless to say, doing the math takes some effort, especially when you get a restaurant bill for 1 million (Dong, that is!). My advice is to change a few Dong ($50 or less), to cover the price of admissions at certain national sites that only accept Dong. Everyone else in Vietnam gladly accepts (and prefers!) USD. Tip: change $100 into $1 and $5 bills before you leave home, as getting change in Vietnam for smaller USD denominations not always possible. Many shops and hotels allow you to settle bill in USD or Dong, and can quote you prices in either. When shopping, get quotes in Dong (for a slightly lower price) but pay in USD. Do not get stuck with Dong, as it is worthless outside Vietnam. We actually used Dong everywhere, but yes you can use USD too and it does make it easier to convert it back to another currency when you get back home! I’m pretty sure though that for Sapa, I would typically suggest traveling with Dong currency! Thanks for your tip Harison! Hi! Great posts! I am wondering if any of the buses you took were able to drop you off at the Topas Ecolodge? I am staying there in September and it seems that it’s about 45 minutes outside of SaPa. Any suggestions would be great! Officially a fan now! Looking forward to more reads 🙂 Take care and Have a nice day! Ah thanks so much Rebecca! Glad you found it useful and enjoy your trip to Vietnam! I can’t wait to return! Such detailed info and a lovely read , thanks loads! My family of 3(adults) plan taking train to Sapa but likely to change our mind and will take the express bus instead. May I ask is it possible that we can move around in Sapa instead of joining the local tour or you would advise the latter ? Hi Jolen, how are you doing? Great blog , thanks for sharing the info, pretty useful. I have a couple of questions to ask if u wouldnt mind please, Im traveling solo in February. DO u think that I should travel by bus to SAPA from Hanoi instead of overnight train? I m not sure if u stated that u prefer by bus even though u did go by train to SApa? Also, if I decide to go hiking solo without any guide tour visiting villages in sapa area, would it be hard to reach the villages without getting lost? any advice please? Generally speaking, do u recommend me taking the bus during night time or its better off during day time since I heard that overnight buses the drives are careless??? is that true? Have u taken any public bus to visit other cities in vietnam or u always booked in advance taking only private bus companies? Thanks and HAPPY HOLIDAYS, I would be very appreciated your response. Im just worried since I will be traveling by myself. You can easily visit the villages by yourself and it is also easy to hire a guide once you are there and feel that you need some guidance. Many go to the villages by scooter instead of hiking, so that is another option. I decided to visit Bac Ha first before going to Sapa, I wonder if I should either go by bus over night to Lao cai and then another bus to bac ha or take the train? Im still confused which one is safer bus or train? some people said that the drivers are crazy but you mentioned that u didnt feel safe either by train? I also found out that there is a bus that goes to bac ha from hanoi departing from bus station My Dinh which is far from Old quarter and departures at 19:30 pm and arrives bac ha at 4 00 am but it also stops in lao cai city before going to bac ha. I did feel unsafe in the train but I think part of it was that the tracks are really old. If you are looking at travelling overnight, I would highly suggest the train above the bus. HI! i loved your post, its so informative and it really helped. I intend on flying into hanoi and going straight to Sapa from the airport. Do the buses pick up from the airport too? Hey! If you want to sleep in Hanoï in an economic way, we welcome you at Hanoi Authentic Homestay, a place where you can sleep in the old quarter of Hanoï ! Me and my family welcome you to our way of life, our diner, ou homestay ! STAY AWAY FROM THIS VIOLETTE EXPRESS!! We had booked a train with Violette Express for 3 people from Sa Pa to Hanoi, but ended up being 2 people when we arrived. When we got to the cabin (2 bunkbeds) there was only water and snaks for 2 people, so we though we were alone. About 5 minutes before parting a strange men came in claming he had my friend’s seat and that he had a ticket. He did not speak a word of english and was not willing to give up the seat, so in the end (because the train had parted, we were dead tired and we couldn’t really do much more) my friend had to move all his things to another bed. We never got to see his ticket and when I asked him he didn’t/acted like he didn’t understand. There was no one there to talk to if you had a problem and we were so tired after 2 days of trekking that we decided to let it sleep. We locked the door from the inside and as i was falling asleep I remember that we had booked a room for 3, and althought we were only 2 in the end, I did not inform the company of this change of situation. The highlight of the trip (irony) was when I was waken up at 1.30 in the morning (I sleep with ear plugs and never wake up) by another men climbing up into the empty bunked bed. I almost couldn’t believe at first and double checked to see if it was the same man, but no. I asked him to see his ticket several times and he just shushed me. I started talking to my friend of what to do, since these men obviously hadn’t pay for a ticket and had just decided to climb into any empty bed they could find. Again we couldn’t really do much and were just being hushed by the two men. At one point the ‘second’ man left the room (I think because he saw me and my friend talking a lot) and my friend decided to go back to sleep. I couldn’t sleep and started thinking how did the man open the door if it was locked, and when did he get in the train if there are no stops between SAPA and HANOI. After a few minutes the man came in again and climb in the bed (I think he taught we had fallen asleep again). Horrible experience and feeling of not being able to do anything, specially having our passports, phones and all our money with us there. Just want to had I am very respectful of other people and cultures, but these men were not carrying anything with them (bags, purses) and it was just scary. STAY AWAY FROM VIOLETTE EXPRESS!! THERE ARE OTHER COMPANIES WITHIN THE SAME TRAIN. Hi Ariel, that sounds like a terrible time. I’m sorry about the experience. As a side note: If you want to have a private cabin, you do have to book all 4 beds, if you only booked 3, someone else can still book that last bunk, as you pay for the bed, not the cabin. But sounds like that 4th person was really illegally on the train. Not good, that no one was around for you to talk too, they should be checking train tickets and make sure that people are in the right spots. Hello, thank for the great posts. Now to go from Hanoi to Sapa we have a lot of choice, the high way is woking so most people choice sleeper bus. For the first choice i was pick the train but for my family, I prefer private car, it fit to my family.